Solid State Drives, aka SSDs for short, are usually the biggest bang for the buck upgrade in modern computers. These days most high performance desktop and laptop computers and some mid-range devices ship from the factory with a SSD already installed.The average user however does not want or need to spend thousands of dollars on a high performance PC. Maybe your device is a few years old and performs decently for your needs, but you often find yourself wishing you could give it a decent boost without breaking the bank. If that is the case an SSD upgrade may be just the thing for you. Conventional HDDs store your data on a set of magnetized disks inside a small enclosure. It is similar to a stack of CDs that spin at 5400+ RPMs. While their performance has improved greatly over the years they still have a considerable “seek time”. Seek Time is the time it takes the disk to find the start position of your desired data on the disk. Say you go to open Microsoft Word. Your hard drive spins up and a small arm has to go to the spot on the disk where the file containing the program for Microsoft Word is at. It then reads that data and transfers it to your processor and to memory which eventually ends up with the MS Word launch screen displayed for you to make a selection such as a new document, open a recent one, etc. Now you select to open a document which you had started writing, but never got to finish. The HDD then seeks and reads that data and a process similar to opening MS Word occurs. Now if somewhere during that process of opening Word or your document you get impatient and decide to open your web browser to look something up or read news the HDD has to send its little seek arm to a different position on the platter and open your web browser. At this point it is also trying to read the data necessary to open Word. It appears as if the drive is reading both of these positions at the same time however in reality it is usually going back and forth between the points of data and sending small amounts of each at a time to allow multitasking. This is a very simplified explanation but it gives an idea of how your HDD works. The average read/write speeds are anywhere from 20MB/s to 120MB/s for a standard HDD. Now that you have an idea of how a conventional HDD works we can try and explain how a SSD works. SSDs do away with all moving parts. There are no platters to spin or a read arm to seek and read data locations. They are similar to a USB flash drive and store data on what is called NAND flash memory. These are circuit chips capable of reading and writing data at speeds from 500MB/s to 1,800MB/s. SSDs generally cut boot times from 1/2 to 1/4 the time of standard HDDs. Another advantage is that they consume much less power. Because there are no moving parts such as spinning platters and seek arms they generally use less than half of the power needed for a standard HDD. For laptop users this will mean extended battery life. One draw back of SSDs is the cost to space ratio. I recommend at least a 250GB HDD for the average user which start at around $75 for a decent SSD. The Samsung EVO 860 is my personal recommendation at the moment. It costs $94.99 on Amazon. 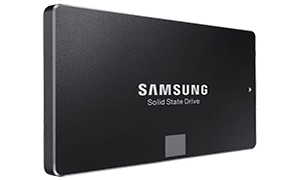 There are other options for less money, but Samsung SSDs are known for their performance and reliability. There is also a Samsung EVO 860 500GB model that is currently listed for $149.99 on Amazon. Gamers and other high end users may want to consider other high end options although the EVO 860 is generally a good fit even for them. I have a Samsung EVO 860 in both my desktop and laptop computers and am very pleased with their performance. I am also a Western Digital Partner and a Seagate Partner. They have been in the HDD industry for years and also make quality and affordable SSD drives. Regardless of your choice of drives you can have it installed by a manufacturer partner right here in Little River, SC. Installing a new hard drive after a failure is a fairly time consuming process because your operating system has to be reinstalled (Windows, Mac, Linux, etc), third party software such as Microsoft Office, Adobe, etc, and setup drivers for peripherals such as your printer or scanner. If data recovery is required and possible that can also be a time consuming task. If your conventional HDD is failing this may be necessary however if your old drive is still functioning you are in luck for a couple of reasons. I use direct drive cloning hardware and make a direct copy from your current HDD onto your new SSD drive. When your computer starts on the new SSD the only difference you should notice is how much faster it is! Also, if your old HDD is still functioning it can be reinstalled into your desktop PC for backing up of data or just extra storage space for archiving photos and documents. For laptops there is generally only one disk drive slot however your laptop HDD can be installed into an external enclosure for extra portable storage. For a quote on getting an SSD upgrade just visit the Get A Quote page by clicking here.